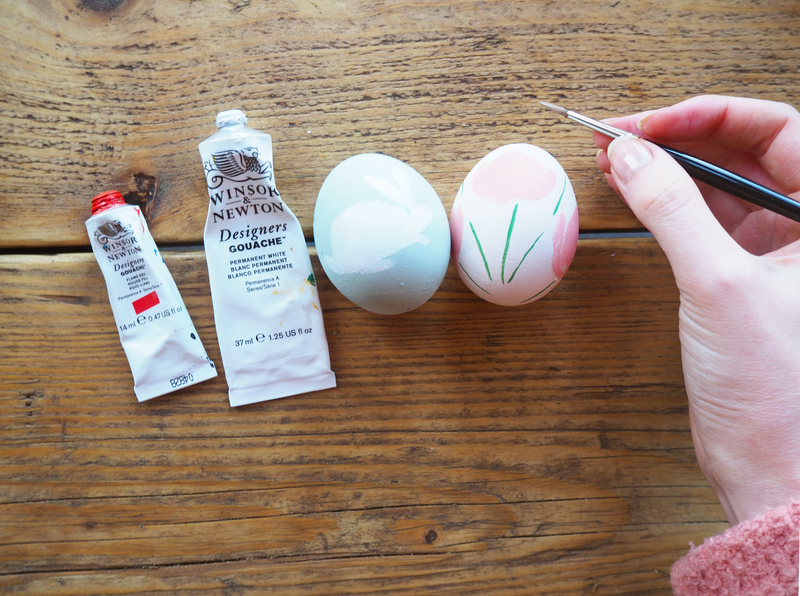 Easter is the perfect time of the year to embrace your creativity and enjoy some good old arts and crafts! Whether you’re looking for activities for the kids, or just looking to get your creative juices flowing, we’ve got just the thing. 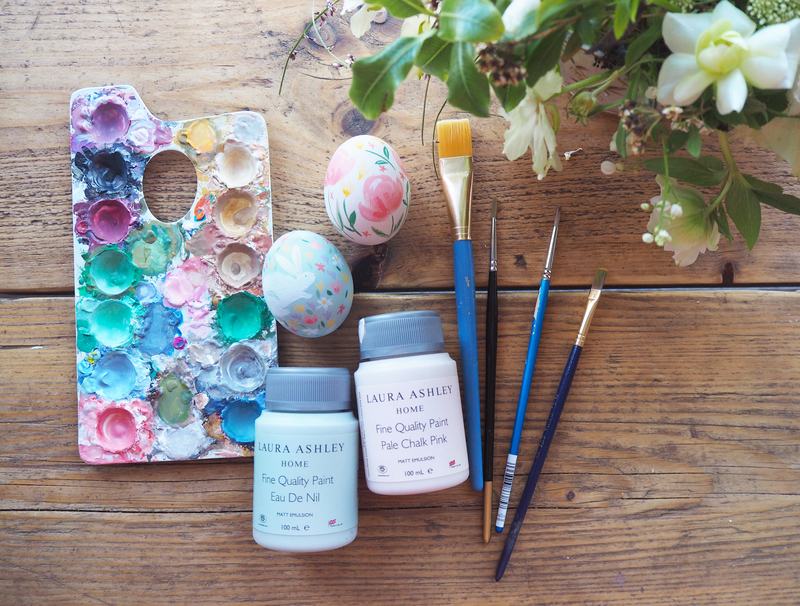 The talented illustrator, Emma Block is armed with Laura Ashley paints as she takes us through a step-by-step guide to help us achieve these egg-celent painted easter eggs that make the perfect addition to your spring home decor. First, you need a clean empty eggshell. 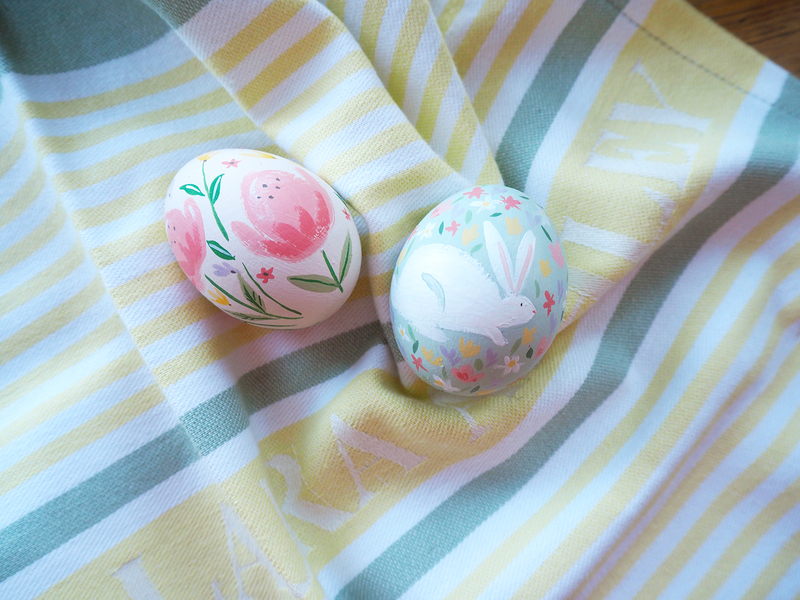 You can buy these from a craft store or blow the egg yourself. To blow the egg use a metal skewer to make a small hole at the top of the egg and a slightly large hole at the bottom. Use the skewer to break the yolk, then blow the contents out into a bowl. Rinse the egg thoroughly then leave it to dry. I like to paint my eggs with a base coat of regular house paint first as it provides a nice matt surface to work on. 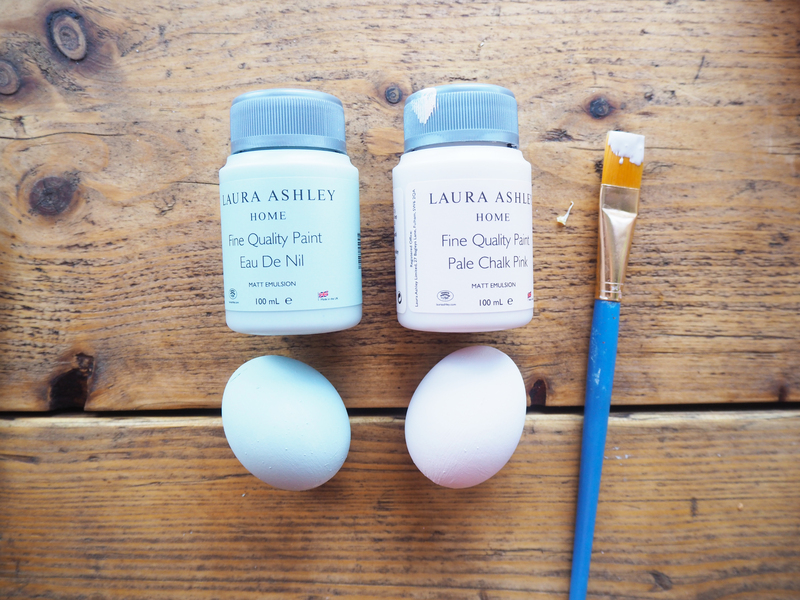 For these eggs, I have used Laura Ashley’s Matt Emulsion in Pale Chalk Pink and Eau de Nil. 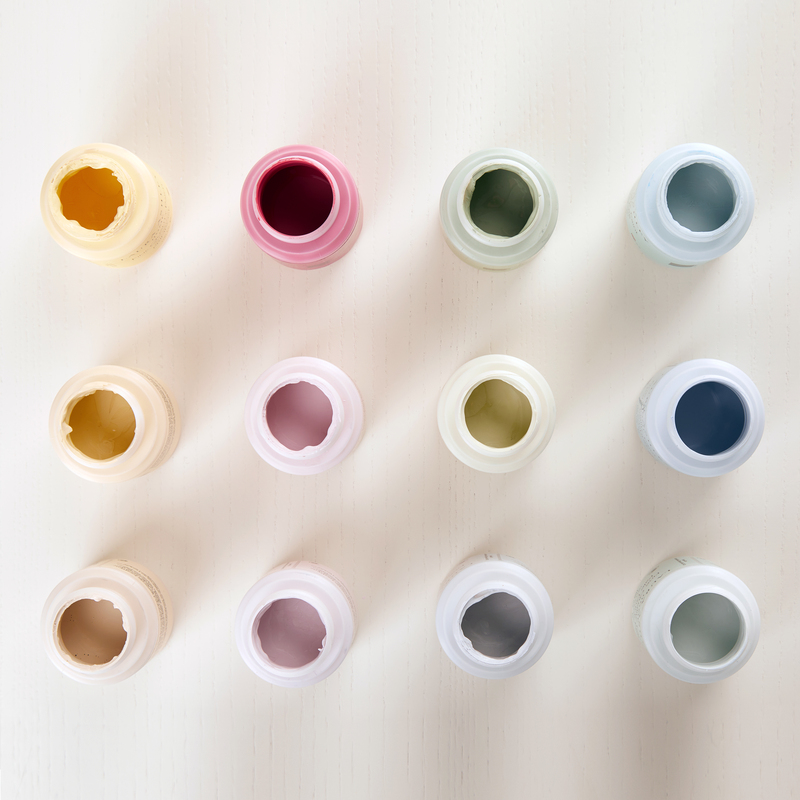 Use a wide flat brush to apply two even layers of base coat and allow the paint to dry in between coats. A good tip is to make a little doughnut of Blutack to rest your egg on so it doesn’t roll around. When the base coat is dry, lightly sketch your design in pencil. 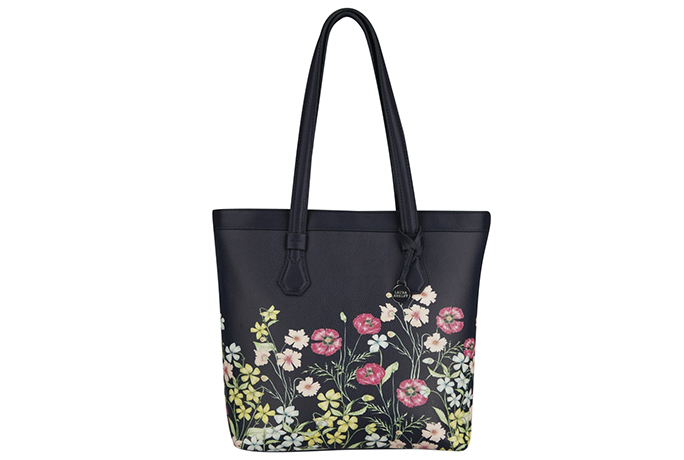 Simple designs and repeat patterns work best. 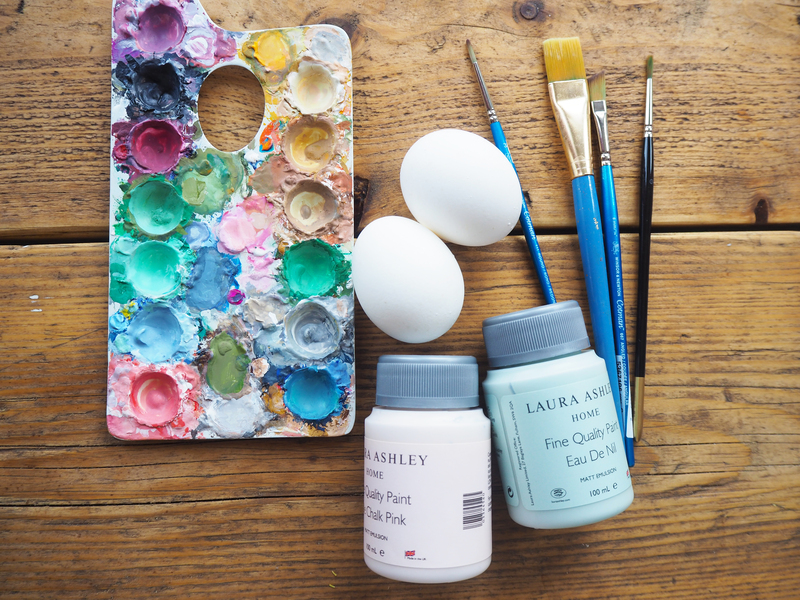 Use acrylic or gouache paint and a small brush to add decoration. Painting on a round surface is tricky, so embrace imperfections! 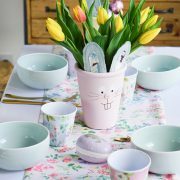 Start by painting a white rabbit on the green egg and simple pink flowers on the pale pink egg. Once that is dry carefully rub out any pencil marks and then add some more details. 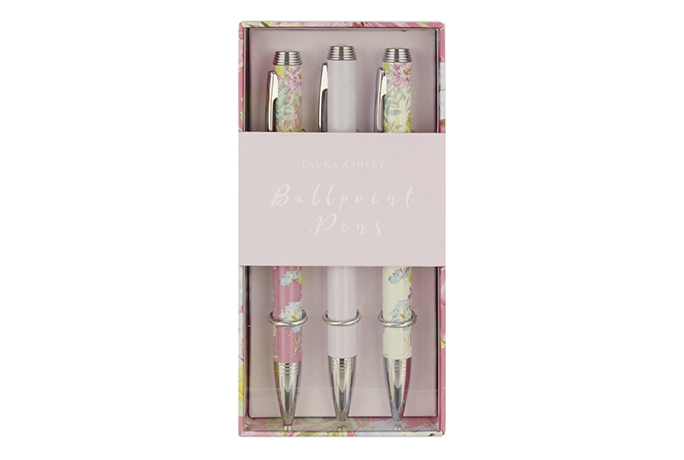 Mix up some pink, pale purple and yellow and using a small brush paint small flowers around the white rabbit. You can also use some white and yellow to paint daisies, and mix up a few shades of green to create leaves. 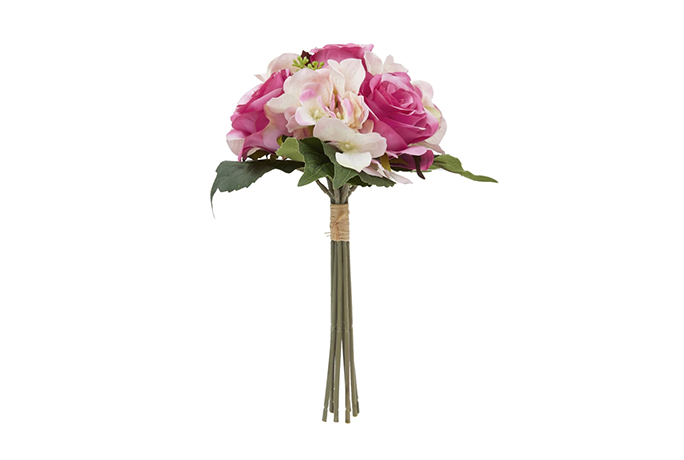 Add details to the large pink flowers using white and a darker shade of pink. Paint additional flowers using yellow and pale purple and add leaves using different shades of green. 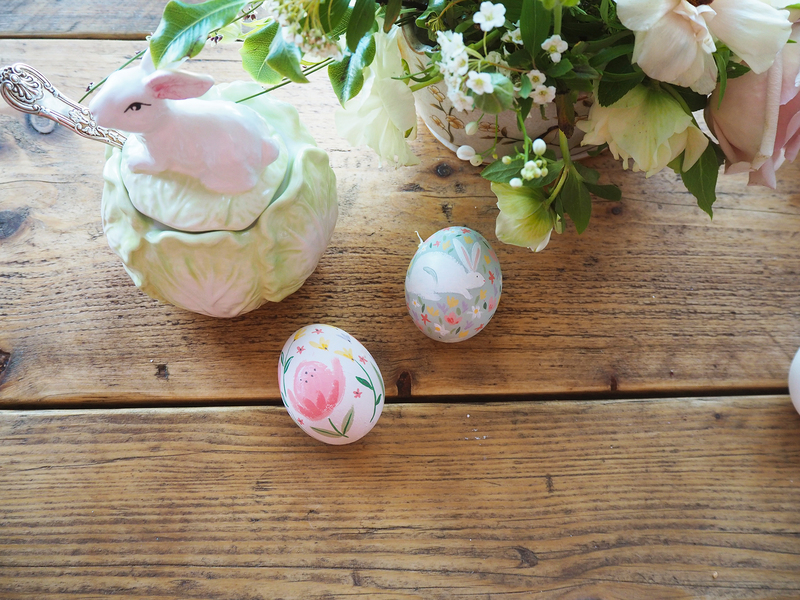 The finished Easter eggs are the perfect decoration for a spring table. 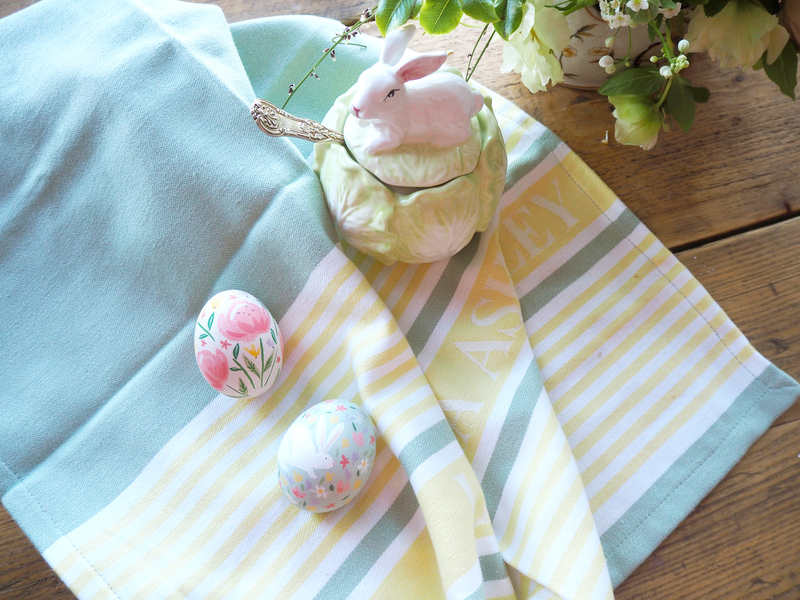 I love how they look alongside my adorable Rabbit storage jar, as well as these lovely tea towels which are the perfect complimenting colours. 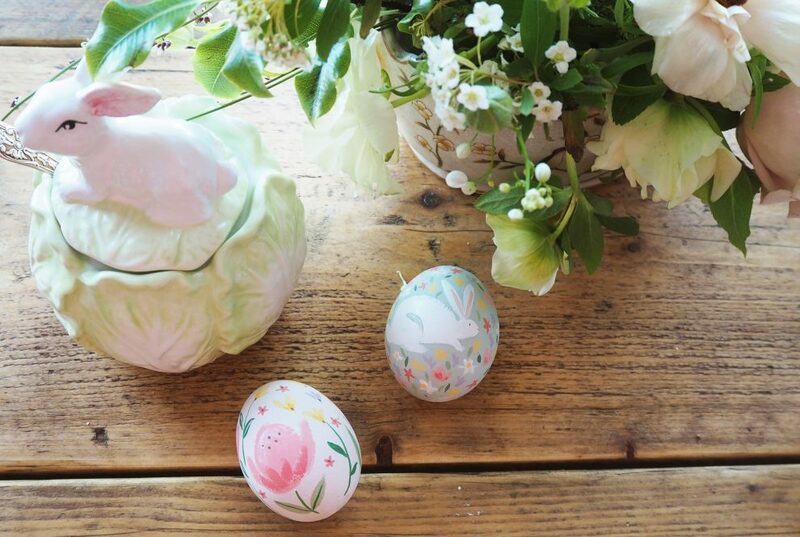 Will you be getting crafty this Easter? 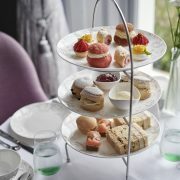 Or are you preparing to re-decorate the house for spring? 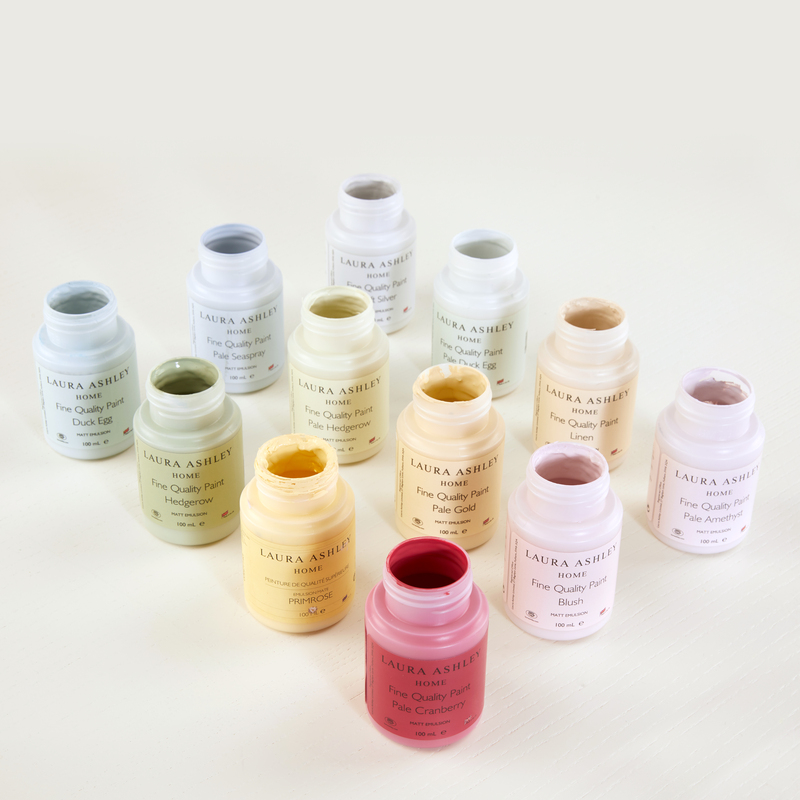 Don’t forget, all of our paint sample pots are available to order online and in store. Order yours today so you can decorate in time for Easter!